There’s nothing I hate more than being late getting the next video posted in a build series! Unfortunately life happens and that’s all I can say about it. 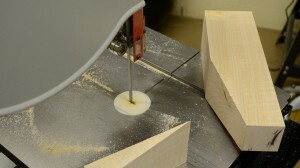 The good news is that I’ll be back in the shop soon to finish up this next episode which features my technique, over on the band saw, for cutting a taper on adjacent faces on these large leg blanks (large enough that I can’t use my table saw the way I prefer too). Stay tuned for the full feature episode to be released soon. I see from your drawings that you intend on putting the tapper to the inside of the legs. You might consider putting the tapper to the outside, yes a bit non-traditional, but it will/can help with stubbed toes. « MBW on The Highland Woodworker? Heck Yeah It Is!